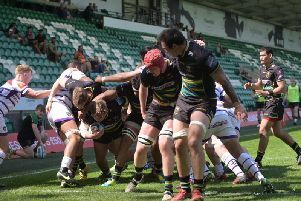 Chris Boyd says his flying visit to Franklin's Gardens was 'of massive value'. Boyd will officially arrive as Saints boss during the summer following the conclusion of the Super Rugby season with current club the Hurricanes. But with the Canes not having a game this weekend, the 59-year-old took the opportunity to fly to Northampton earlier this week. He has spent time meeting members of staff - the playing squad have been given the week off - and even visited club captain Dylan Hartley at England's Pennyhill Park base. And Boyd said: "It's been of massive value. "We have a bye week in Super Rugby this week so I've been here for four days, will go home tonight (Friday) and won't get home until Sunday and back into Hurricanes on Monday. "I'll come back in April for another visit where we make sure we get our game plan and philosophy around pre-season nailed. "When England go to South Africa and France go to New Zealand (in June), Super Rugby will take a break for three weeks so I'll get back here for a couple of those weeks and get back here for the start of pre-season, which is really important. "It's been really good this week and the challenge for me is really exciting." On what he has been up to at Saints, Boyd added: "It's been a meeting-athon. "I've managed to meet all the coaches, the strength and conditioning people, the analytical people and the medical people. "We're just setting up to make sure we've got some really good alignment going forward."